If you are looking to rent a dumpster and get rid of wood waste and other materials, there are several questions you must ask the rental service. To ensure that your property is safe from damage, speak to your rental service about the storage and disposal of dumpsters. The following questions address many concerns you must consider, especially when complying with local laws on waste storage and disposal. Not only can you get the best deals on renting dumpsters, you can also protect yourself from any unexpected costs of damages or fines. When renting a dumpster, you must take into consideration the size and weight of the product. If you have large amount of waste, you should also understand that the container is most likely heavy to handle and could affect your driveway or lawn. Placing a large dumpster in your property without care can damage your lawn, driveway or yard if not handled carefully. Assess the materials that constitute your driveway and find a suitable alternative to place the dumpster without causing damage. You can use additional cushioning or plywood layers to protect the susceptible layer. Rental companies for waste disposal dumpsters provide many options based on time frames. Depending on how long you want to rent the dumpster, companies will provide you with suitable quotes. For example, if you are undertaking a quick cleanup over the weekend, you only need to pay about two days rent. However, if your project is likely to take up a few weeks or months time, you can ask for more permanent solutions. If you are keeping the dumpsters for longer, you can work out long term rental plans that save you money. 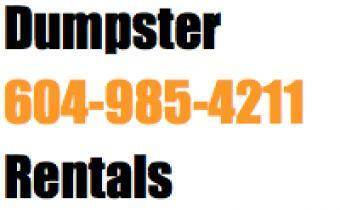 Most rental companies do not help you find the right storage space for your dumpster as it is your responsibility. Ensure that you speak with the rental company beforehand and make arrangements for the dumpster in a safe and convenient place. If you don’t have space in your property, you can choose to keep it in the streets provided you clear the matter with the city as well as the neighborhood. The safety and integrity of the rented dumpster is your responsibility as long as you rent it and store it on your property. The rental company will most likely not take responsibility for any damage caused to the property or the product during the rental period. An important aspect of renting a dumpster you must not forget is complying with the rules and regulations of both the renting company as well as your city. Whether it is storing, costs, damage as well as waste disposal, it is important to read up on the laws. Depending on the nature of the items, whether perishable items, wood waste or hazardous materials, you will have to make arrangements to dispose them safely and legally. If you are dealing with more dangerous waste like batteries and electronic equipment, seek professional help on packaging them safely and sending them for recycling and/or disposal. Watch our dumpster bin rental service Video. Watch our dumpster rentals service in Vancouver.